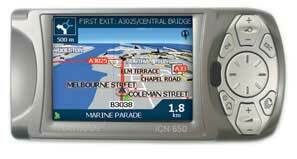 Released in 2004, the icn 650 was Navmans flagship in-car GPS Navigation Device. With a 2gb hard-drive, magnesium alloy case, voice guidance & 3-D street level maps of the whole of Western Europe, the 650 demanded a premium price, and was seen as a top-of-the range product. Now available for less than the price of a new entry level Tomtom, is the Navman 650 a viable alternative for the driver on a budget? I took an icn650 on a two-hour drive down roads I didn't know to find out, read on for my verdict. If you're lucky enough to get a 650 in a box, you'll get the unit, bag, polishing cloth, car lead, power lead, usb lead, sucker mount, hard mount, remote control, all the maps for Western Europe, and operating system discs. Wow! When you first handle the 650, you notice how heavy the thing is. Its outer casing is a magnesium alloy, and feels very tough. The buttons feel durable too, thick rubbery types, with the right amount of give. The Navman 650 does not have an internal battery, so lets go out to the car & plug it in! First, you have to flip up the GPS receiver on the back, fix the unit to your windscreen with the usual sucker-mount, then plug the power lead into your cigar lighter, making sure the light on the plug comes on. We're now ready to test. As the unit powers up, it loads the maps into memory, comes up with the usual warning about not using it while driving, then the unit will get a GPS fix, and the map of your vicinity will appear. The Navman 650 has a very good screen, bright & crisp. For really sunny days you can turn the brightness up, but I kept it in the middle position. Lets go somewhere! The 650 has the usual combination of destination input options, address, town-center, Points of Interest (fuel, hotels, etc), favorites, & recent. Post-code input (for the UK) is only 5 digits long, eg SO15 3, so you still have to put in the road name & number. This isn't a problem for me, but it is slightly slower than the full postcode options on newer devices. The Navman does not have a touch-screen, so destinations are entered by using the pad to the right of the screen, navigating around a virtual keyboard. This is slower than using your finger like on a Tom Tom, but it works. The 650 worked out my route (about 50 miles, avoiding motorways) very quickly, and we were off, the very loud (but ajustable) speaker barking out voice instructions. Fine. When using the Navman, you get the feeling you're using last-years model, not that that's a big problem, but you know things are now done slightly better. The 3d map is crisp & clear, but you wish it would zoom in just that little bit more. The voice is loud enough, but it should come in slightly earlier. The Navman took me around my chosen route with no worries at all, dealing with deliberate wrong turns quickly. Very good. The unit did come unstuck from the screen a couple of times, probably beause it is so heavy, and it did switch off once or twice (no battery back-up & I knocked the plug), but it did turn back on straight away, and get straight back on with my route. My conclusion? You have to start off with the fact that the maps are from 2004, but it does offer excellent specification. If I needed a GPS device to get around Europe, and was on a budget, I would definitely buy one of these. The build quality is superb, the screen bright, & voice loud. You cannot get a better European navigator at this price. If I needed a GPS device for the UK I wouldn't buy a Navman 650. Better units, like the Tomtom One, are avaible for a similair price. It's too big & heavy, and annoys when you knock the plug & it turns off.